WhatsApp is a well-received and cross-platform freeware owned by Facebook, which can be used to send text messages, pictures, voice calls, other media files and documents conveniently. For a great number of global users, problems still remain when face to restore WhatsApp's data, especially recover deleted WhatsApp messages. The page gives 3 tips to resolve this issue. Here are two situations involved, if you have backup your WhatsApp before the data loss, you can use all the 3 methods to recover deleted WhatsApp messages, and the tip in Part 2 is recommended at first. If not, that is to say you lost WhatsApp data without any backup, you can only use Android WhatsApp Data Recovery to get the deleted files back, which is mentioned in Part 1. Part 1. Recover Deleted WhatsApp Messages on Android without Backup? Part 4. How to backup WhatsApp to Google Drive? "How do I recover deleted messages in WhatsApp if I didn't backup the messages?" - A question from Quora. As the question asked above, sometimes you may delete WhatsApp messages by accident and have no time to backup them. Please do not worry about that, Android WhatsApp Data Recovery will remove this embarrassment for you. Android WhatsApp Data Recovery is a professional software to recover deleted WhatsApp messages, as well as other lost WhatsApp data, such as chat history, images, videos, attachments and so forth. With it, you can preview all the recoverable data and extract them to computer selectively and completely. 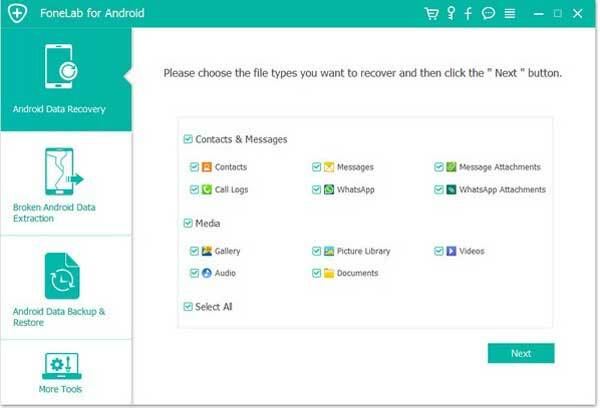 This program can not only work for WhatsApp, but also recover deleted contacts, call logs, text messages, messages attachments and media files from your Android device to computer. It is also a good tool for Android data recovery. The program supports many brands with Android OS from Android 2.3 to Android 8.0, including Samsung Galaxy S9/ S8/ S7/ Galaxy Note8, Moto Z2 Play/ Moto Z, HTC U11, Sony Xperia X, LG Q8, Huawei P10, Xiaomi Mi 6 and so on. Now please go ahead and see how it works. Step 1. Please download and install Android WhatsApp Data Recovery on your computer, here are two free trials for Windows/ Mac, you should choose the correct one according to your computer operating system. Step 2. Launch the program, connect your Android phone to computer via a USB cable. Step 3. Enable USB debugging as the prompts shown in the interface. 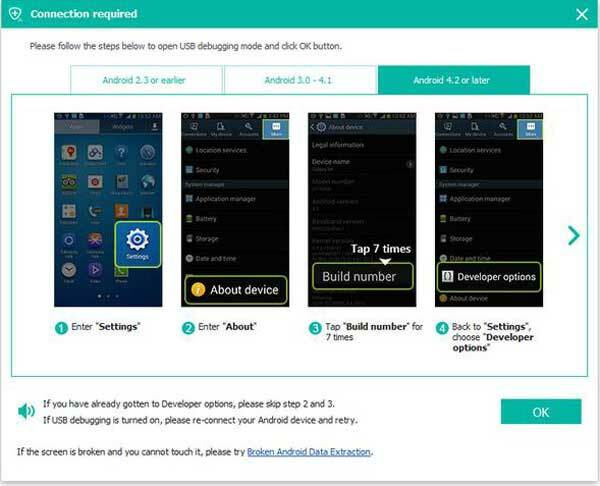 The program will give a guidance about how to enable USB debugging of different Android operating systems. Step 4. Once your device was detected, the program will automatically scan your Android phone and you can see the interface shown below. Please select "WhatsApp" and "WhatsApp Attachments" > click "Next" to preview the selected data. Step 5. Please select the deleted information and check the detailed items you would like to restore, then click "Recover" to retrieve them from Android phone to your computer. One simplest way to retrieve your deleted WhatsApp messages and chat history is to get its backups back. Actually, when you install WhatsApp, you can make a setting to sync your files to Google Drive cloud. Step 1. Please uninstall WhatsApp from your Android phone. Step 2. Reinstall this application and sign in it. Step 3. Run the reinstalled WhatsApp and a prompt will pop up to let you restore messages and media from Google Drive, otherwise, you can never restore deleted messages later. Just simply click "RESTORE". 1. Please connect your phone to a stable network or WiFi during the data transferring. 2. Use the same phone number and Google account that you backup your WhatsApp to restore the deleted files. 3. It does not support selecting files, instead, it will download all the backup files. So please make sure the internal storage space is enough. 4. If you have not backed up your WhatsApp before the data deletion, you can not get them back by this way. 5. You can visit WhatsApp official website for more FAQ. Does not have a Google account associated with WhatsApp? Thankfully, here is another way for you. WhatsApp supports recovering deleted messages from local files within 7 days. You can find your backups from SD card > WhatsApp or internal storage. Step 1. Install a file manager and run it on your phone. Step 2. Click "SD card" > "WhatsApp" > "Databases". If you can not find this folder on your SD card, you can click "Phone storage" instead. Step 3. Rename the files you like to restore from msgstore-YYYY-MM-DD.1.db.crypt12 to msgstore.db.crypt12. Step 4. Uninstall and reinstall WhatsApp from Google Play, please specify the phone number you have used before. Step 5. Click "Restore" in the "Restore chat history" window, and the job is done. Step 1. Download WhatsApp from Google Play, install and run it on your phone. Step 2. Please go to Menu > Settings > Chats > Chat backup, then select "Backup to Google Drive" to set a backup frequency. Many users sometimes lose their WhatsApp messages due to a wrong operation. We really hope you did make a good backup and can find your lost data back by the ways mentioned in this article. 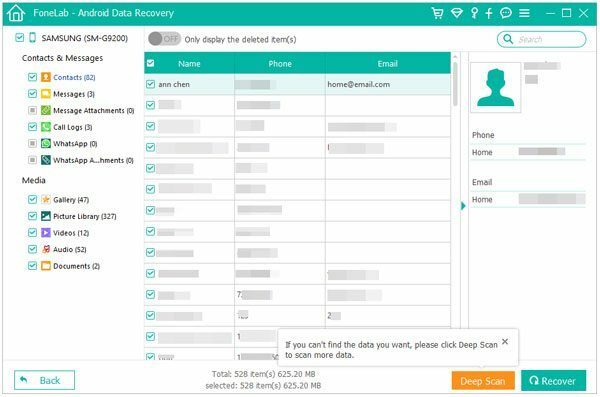 If the bad thing happens and you have not backed up your WhatsApp, please do not worry, Android WhatsApp Data Recovery can do a great favor in this case. How to Recover WhatsApp Pictures on Samsung Galaxy S/Note/J/A? How to Delete WhatsApp Contacts on Android/iPhone?